Jailed former Russian tycoon Mikhail Khodorkovsky has pleaded not guilty to new charges of embezzlement and money laundering at his trial in Moscow. The former head of the disbanded oil firm, Yukos, is accused of embezzling 900bn roubles ($26.4bn) and could spend 22 more years in prison if convicted. 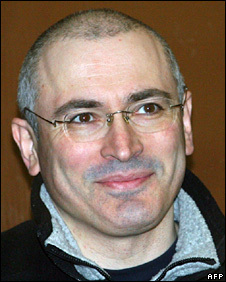 Once Russia's richest man, Khodorkovsky was jailed for eight years in 2005 for tax evasion and other offences. His family has said the new charges are both politically motivated and absurd. They accuse the government of wanting to keep him behind bars well beyond the end of his first sentence because it fears he will become the focus of an opposition movement. Officials deny the allegation. Meanwhile, another court in Moscow has granted parole to a former Yukos lawyer imprisoned nearly four-and-a-half years ago on charges of embezzlement and tax evasion. If I stole the oil... and profits while the state got 40 billion roubles in taxes, what were the taxes paid for? Svetlana Bakhmina gave birth while in detention in November. She was unusually denied early release twice while pregnant. The BBC's Rupert Wingfield-Hayes in Moscow says that in a country known for its apathy, her case seems to have struck a chord with the public. More than 95,000 people signed a petition demanding her release, along with the former Soviet leader, Mikhail Gorbachev. Our correspondent says lawyers and human rights groups believe the charges against her were completely groundless and that she was a pawn in a vicious political battle between the Kremlin and Yukos. Wearing jeans and a brown jumper, Khodorkovsky was led handcuffed into the courtroom in Moscow on Tuesday and sat in a glass cage. Khodorkovsky's former partner, Platon Lebedev, called the charges "falsified"
In response to each of the four separate charges that were read out at the start of his second trial, the former oil tycoon said: "I plead not guilty." Both Khodorkovsky and his former business partner Platon Lebedev, who was also convicted of tax evasion in 2005 and jailed, are accused by prosecutors of helping to embezzle some 900bn roubles of Yukos assets and launder 500bn roubles ($14.7bn) between 1998 and 2003. 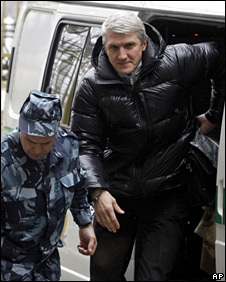 Lebedev, who also pleaded not guilty, called the charges "blatantly falsified". "This is not an accusation but a schizophrenic fraud," he said. "I have never stolen anything nor raided anything in my life, either individually or in a group. To confess to a crime that has not taken place is ridiculous." The two men say the new charges amount to an accusation that they stole all the oil produced by Yukos over five years. "If I stole the oil... and profits while the state got 40 billion roubles in taxes, what were the taxes paid for?" Khodorkovsky told the court on Tuesday. Defence lawyers also argue that Khodorkovsky and Lebedev are being tried a second time for the same alleged illegal activity they were convicted for in 2005. The trial, which is closed to the public and media, is expected to last for at least several months.